Call of Duty developer Treyarch thinks that the best way for a publisher to combat pre-owned game sales is via quality and an excellent multiplayer mode. In case you've missed it, the GameStop (et al) used game market has been a bit of a hot-button issue in the industry lately. Publishers and developers complain that it cuts them out of the loop entirely, while retailers and many consumers say that it is their legal right to sell and buy pre-owned titles. While some houses like THQ and Electronic Arts have started to include download codes that can only be redeemed once for extra content - or sometimes for the full multiplayer - in order to dissuade used-game buyers, not all developers agree. 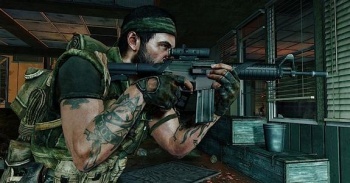 Call of Duty: Black Ops developer Treyarch thinks that developers should focus on producing a great game that players won't want to trade in rather than penalizing used game buyers with special codes. Speaking with MCV last week, Treyarch boss Mark Lamia said that if his studio did its job with Black Ops, gamers would want to keep playing. "I want to take [Project Ten Dollar et al] in the other direction and bring consumers really great reasons to keep their games, rather than trade them in," he said. "Multiplayer is critical to the success of this series. It has such tremendous staying power - there are millions of people playing Call of Duty every day. It's entertaining people on a magnitude that's mind-blowing and we work really hard to make sure it's supported for a long time." That support is the key, said Lamia - a developer can't just put out a multiplayer mode and forget it exists. "We have a team that continues to work on [the multiplayer] for World At War. We've done that for a long time and expect to do so for this game ... we're going to support the hell out of Black Ops. That will be our focus post-release: making sure we keep our fans engaged, and hopefully as a result, they'll want to keep playing our game and won't want to trade it in." Will we see any pre-owned codes designed to limit access to multiplayer in the anticipated online shooter? Not a chance, says Lamia. "You won't see that for Black Ops ... the multiplayer comes with the game you buy - you don't have to do anything else for that." That's not to say we won't see DLC after launch, but I suspect the idea of paying for additional content creation will sit better with more gamers than getting locked out of key features for buying a pre-owned copy would.